Midland Retriever Working Test..where patience brings its own rewards. A lazy June morning was unfolding as I headed West to the Midland Retriever Working Test. Cows chewing the cud in buttercup meadows, a cloudless blue sky and not a whisper of a breeze. All boded well for a perfect day. One of the most enjoyable aspects of the Summer circuit of working tests is that they are generally held in the most hidden places of Ireland. Off the beaten track and down country lanes to places only the locals know of. Today was one of those days. For most of my life I have passed through Mullingar on my way to the West. 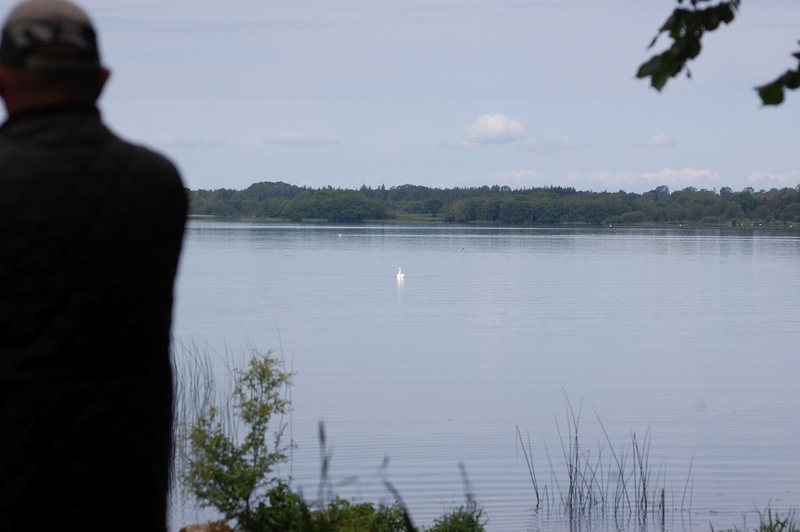 I never imagined such a jewel as Lough Ennell was practically on my doorstep, less than an hour from my home. Today I had travelled with four chesapeakes. I was competing with Mossy in Novice and Bertie in Advanced and had also taken Uisce along for socialisation and Winnie as company. I arrived into the grounds early enough to take the girls and Bertie for a long walk before the competition began. 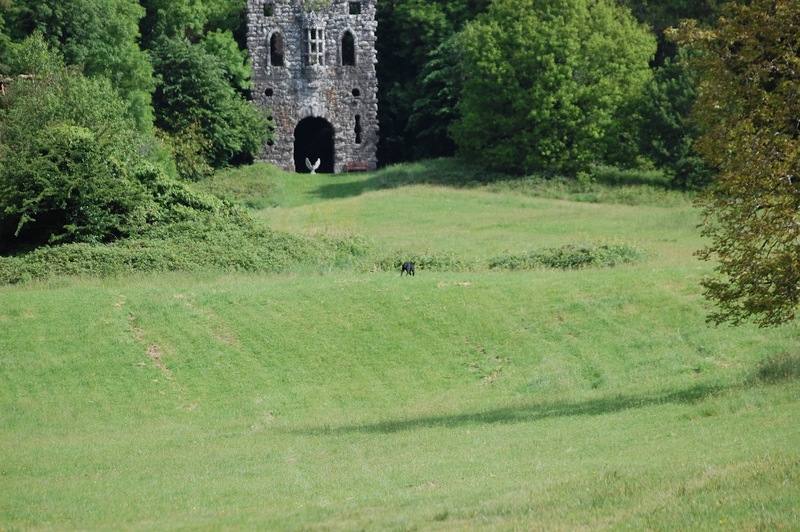 It gave Uisce the opportunity to explore waterfalls for the first time, meet an array of dogs and people of all sorts and sizes as the venue Belvedere House is open to the public and the sunny day had brought forth families, runners and dogs in abundance. She loved it and was a tired, happy puppy when I put her back in the trailer to focus on Mossy. I have long given up getting nervous before a working test. It’s pointless. I have no control over the type of tests set up by the judges. I know exactly what stage and level my own dogs are at in their training and I use working tests as a method of challenging them and seeing what else needs to be worked on. If we are lucky enough to bring home a ribbon its a bonus, but my main focus is how my own dog handles the challenge of a difficult retrieve in relation to how I have trained him. The type of tests I enjoy most are the ones where some thought and imagination has gone into the set up. This stretches all dogs and, I feel, if my dogs get through them, win, lose or draw they have done a good job. The first test in novice was a long single mark with a jump. A two dog line up. A nice way to settle young dogs in line. I had only bought a roll of the famous orange barrier tape last week and had put the dogs over it once. So I suspected Mossy may run the fence as it was easy for him to see a way round. He did, but I was happy he ran the distance to the mark, showing he has overcome a problem he had last year of marking short. Today was not the day to school him about jumps, that was for the next training session. On to the water test. Again a single long mark approximately one hundred meters in open water. The temptation here, for most dogs, was to run the bank for which they would lose marks. Mossy completed the long swim with ease. On then to the last retrieve, a mark from cover. Dogs were taken in pairs and the retrieve was up a hill into heavy bushes. He sat steady, and quietly went when asked, just needed handling onto it. Advanced tests started in the afternoon. This was Bertie’s first working test since I had taken him to the mock walk up in Enniskillen last March. I was delighted to find that in the walk up on the first retrieve he settled in the lineup and sat quietly until sent. First test completed with ease. The second retrieve was a tricky blind in deep cover. There was no track for the dogs to follow until the point where the blind was laid. If you didn’t manage to stop your dog before the flag they pulled towards the path and disappeared in the woods. There was very little vision to play with for handling. Bertie pulled left, I had to whistle him back in view push him back and hunt up..got it! 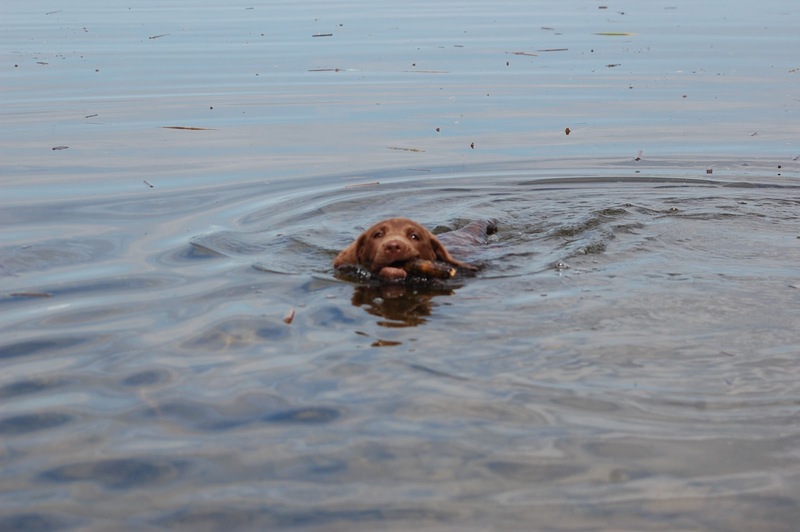 The last retrieve was the water test and it was was proving to be the undoing of most dogs. It was a blind set on an island with a diversion thrown from the shore. If the dog ran the shore they would pick the diversion which was not to be touched. So you had to cast the dog straight into open water between a line of rushes then, once clear of the rushes, cast left towards the island which was two hundred meters away. It required a dog to handle well in water and up until this Summer it would have been the weakest point in my dogs’ training. It was a pure joy to watch Bertie take on this challenge, ignoring the diversion and taking direction out in the water. He made it to the island and hunted. Unfortunately when he pulled left on the island he slipped into the water among the rushes and gaining no scent headed for the diversion. With no vision to direct him he came to shore. A good effort but, as the judge told me, handler error. I should have held him in a tighter pattern on the island something I will not forget in future. This entry was tagged animal, dogs, gundogs, writing. Bookmark the permalink.